I belong to a Facebook group for alumni from my high school, and every now and then I get updates about my classmates and alumni from other years. A few years ago, I learned through this group that one alum (a few years older than me) had become somewhat famous. Sara Schaeffer is a comedian who had a show on MTV called Nikki & Sara Live. She’s been a guest on other shows like @midnight, and she even has a Wikipedia page! Anyway, I thought this was pretty cool, especially since my high school has only been around for 20 years. 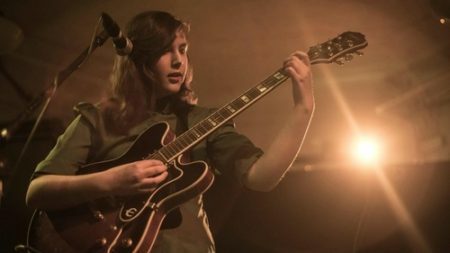 So when I got an alumni update a few days ago about a singer/songwriter, Lucy Dacus, who graduated from my high school a few years ago, my curiosity was piqued. Could this be another famous person? I bought Lucy’s album, No Burden, from iTunes. I’ll be honest: I had low expectations. I shouldn’t have, but I did. Those expectations were blown out of the water. Lucy’s music is incredible. The lyrics and composition are superb, and her voice is so, so good. She reminds me a lot of the lead singer of Heartless Bastards. Lucy isn’t as famous as Sara Schaeffer yet, but I really think she’s going to be a big deal. A huge deal. Who’s the most famous alum from your high school? This entry was posted on Tuesday, May 10th, 2016 at 9:11 pm	and is filed under music, question of the day and tagged with music. You can follow any responses to this entry through the RSS 2.0 feed. Mostly sports related from my school in Australia. If you’re an Aussie, you absolutely know who these guys are. That’s really cool! I haven’t heard of the Waugh brothers, but Ian Thorpe is very famous worldwide. I bet most people know who the Thorpedo is. Gordon Brown, the former Prime Minister of the U.K. went to my high school, Kirkcaldy High School in Scotland. Nice guy, bit glum. Wow, that’s cool! I definitely agree – based on TV, he’s a bit door. Seemed to have a great head on his shoulders but sadly politics is too much about having a big personality (see Trump). Darius Danesh was a year or two above me at school. Because of the common heritage, my parents used to be friendly with his. I had very little interaction with him though. I went to school with Denny Hamlin and Sean Marshall (Pitched in the MLB). Do you remember playing soccer with Brandon Hedrick? His sister, Christina went to Manchester and is a Rockette. Just listened to Lucy’s music. Excellent!! -Kris Kelderman played professional Soccer at DC United, and now coaches a team in Milwaukee. -John and Tami Whitlinger were both professional Tennis players. George Bergstrom, the architect who designed the Pentagon, is in my High school hall of fame, but his Wikipedia article says he went to a private academy out East. From my class, Jon Fleming is an actor known for his roles in blockbusters such as Frathouse Massacre, Couples’ Retreat, and recurring roles in a number of TV shows I’ve never heard of. It took me a while to think of an answer, since my high school maybe had 500 students total… I finally thought of Taffy, who graduated a year before me. I took physics, AP chemistry, and AP Spanish with her however. She published her first book, Stoodie, before graduating under the pseudonym Taffeta Chime. Before graduating from college, she published another about an underwater city. She may have already published another, being 4 years since the last! Yul Kwon, who won Survivor: Cook Islands, went to my high school. He was two years ahead of me and we never spoke but that’s who I’m claiming as our most famous alumnus.